As Dunkin’ continues its brand evolution, the coffee chain has also revitalized its beverage offerings with a line of bolder espresso drinks debuting Nov. 19. Over the next several months, the coffee chain will introduce an affogato — espresso poured over sister brand Baskin-Robbins’ ice cream — as well as a white chocolate latte for the holidays. Dunkin’ is also testing out a flat white and have rolled out nitro and cold brew espresso beverages at their Next Generation stores. These new offerings may sound familiar, and Dunkin’ executives say they’re fully aware the brand is being compared to Starbucks. But, they say, Dunkin’ is not trying to be an imitator. 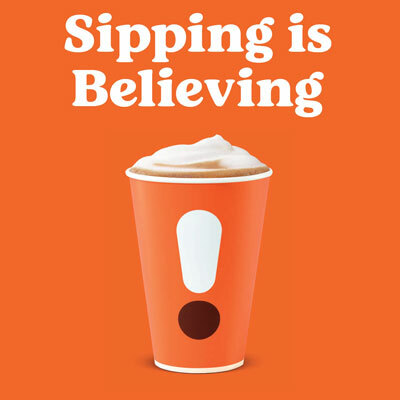 Hoffmann said traditional drip coffee “is aging,” and the brand has shifted its strategy to reach 20 and 30-somethings, who are more likely to offer a bolder, espresso-based beverage than a standard hot or iced coffee which Dunkin’ has historically been known for. That said, Dunkin’ will soon be physically taking on Starbucks’ turf. Chief Marketing Officer Tony Weisman said that the brand has a major expansion in the works, with 1,000 new locations planned by 2020, many of which will open west of the Mississippi. He also hinted that Dunkin’ would finally come to Seattle, Starbucks’ home market. How will Dunkin’ stand out from the ubiquitous green apron? By focusing on speed and efficiency, executives say. The brand is introducing new mobile technology integration and modern store designs that make picking up coffee or breakfast coffee easier for on-the-go customers. Dunkin’ is introducing a newly redesigned app that’s “brighter and faster” for customers to use. It is also testing what it calls the “world’s first-ever” mobile drive-thru at its Next Generation concept store in Quincy, Mass. The new drive-thru design features two lanes: The orange lane is for traditional drive-thru orders, while the pink lane is for mobile customers. The store will use geotracking technology to identify when a mobile order customer enters the parking lot. From there, the Dunkin’ crew can time order preparation so that the customer can seamlessly pick it up at the window. Customers picking up a mobile order in-store, they will find their names on a digital board at the front of the store that indicates the status of their order. The new store also features a customer-facing eight-tap system, where Dunkin’ crew can pour drinks like bartenders, including nitro, cold brew, two original blend coffee taps, decaf, dark roast, green tea, or iced tea. Dunkin’s improved efficiency also transfers over to the beverage-making process itself. 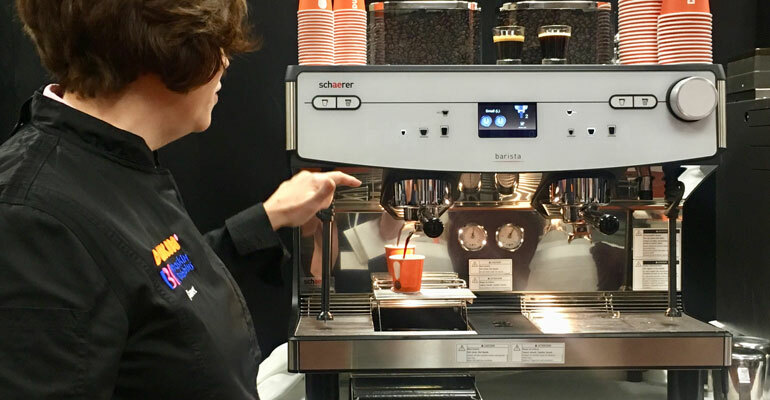 Dunkin’ franchisee Parag Patel — a member of the Dunkin’ espresso relaunch team — said that his team worked with manufacturers of the brand’s Schaerer Barista machine to shave off “precious seconds” from the preparation of espresso beverages. 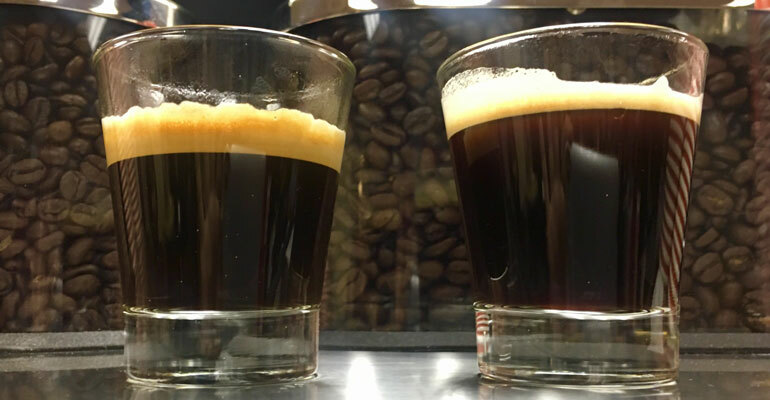 On average, the custom machine can make an espresso drink in just a couple of minutes. But efficiency and improved mobile technology won’t matter if the product is not up to par. 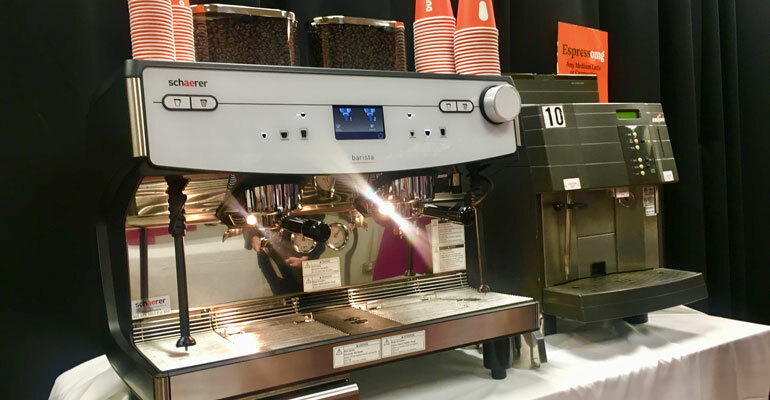 Dunkin’s espresso team spent several years developing the new espresso recipe. They eventually settled on a recipe that’s slightly cooler, less watery, and with a caramel-colored crema on top. Chief marketing officer Tony Weisman said the offering puts the brand on par with other premium coffee brands. “I’ve said it before and I’ll say it again: There’s no need to go to Starbucks anymore” Weisman said. Dunkin’ is offering free samples of its new caramel and white chocolate iced lattes on Nov. 16 and Nov. 17 from 10 a.m. to 2 p.m. During the week of November 19, customers will be able to try medium lattes or cappuccinos for $2 all day. The suggested retail price for a medium latte will normally be $3.39. Correction: Nov. 14, 2018: This article has been updated to correct the spelling of Dunkin' franchisee Parag Patel's name. It has also been updated to clarify details about the chain's espresso rollout and expansion plans.